Got one in Oxford. Thanks OP. about 4 left on the shelf. 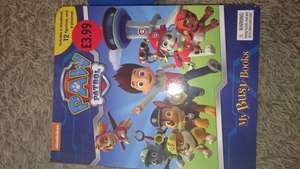 paw patrol things are usually hugely overpriced for plastic tat! £5 in Tesco, their standard price for Busy Books. I agree, Paw Patrol toys are way overpriced! But aren't so many kids toys?! Thanks op. just got one in bognor regis store. still had 5 left.